UFCW/RWDSU and Teamster members in both Boston and Philadelphia expressed deep concern about the now lengthy struggle to exercise fundamental human rights at Coca-Cola in Indonesia, the Philippines and Haiti outlined by the delegation and also at ongoing human rights struggles by workers in Ireland and Spain described by IUF representatives. Upon learning more about the background to the struggle in Indonesia, Coca-Cola union representatives and workers were particularly outraged at Coca-Cola's continued support for repressive workplace structures that are a legacy of the Suharto military regime that came to an end in 1998 but today is still internationally recognized as having been one of the most corrupt and brutal in history. The regime that was directly responsible for the deaths of thousands of Indonesians and for spreading massive corruption, including throughout the Indonesian legal system, left behind a corrupt system of workplace organizations that continues to repress workers' rights today. 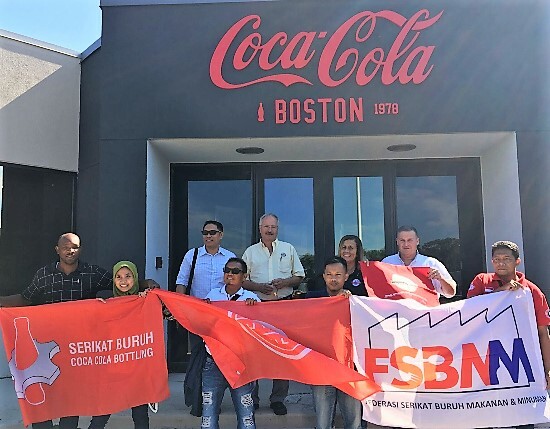 Wherever the delegation went workers, students and union representatives were shocked and outraged that it is that Suharto legacy structure that Coca-Cola management in Indonesia continues to shore-up.